Not enough people appreciate the versatility of apple cider vinegar. In vegan cooking, it's an absolute must have kitchen staple - you can read about my other kitchen staples here. But did you know it goes beyond cooking and crosses over in to health and beauty, as well? Last week I took a poll on my Instagram story asking my followers how much they knew about apple cider vinegar. Most people answered "a little" which lead me to ask if you wanted to know more, resulting in a resounding "yes!!". Before I share some of my favorite uses for apple cider vinegar, let's look at how it's made. Apple cider vinegar is made from fermented apples. First, they're crushed and squeezed into a liquid. To ferment the liquid, sugar and bacteria are added, which turns it into an alcohol. After this is achieved, a second fermentation process begins, turning the alcohol into a vinegar over time as a bacteria growth will naturally occur. Getting to know the staples of your kitchen beyond their traditional uses will expand your culinary world. Apple cider vinegar - out of all varieties and purposes of other vinegars - is my personal favorite and my most used. Read these five ways to use apple cider vinegar to see if you can try something new yourself! Obviously buttermilk does not occur naturally in the vegan world, despite having every possible kind of nut or seed milk available nowadays. However, fear not! Adding a tablespoon of ACV to any of your non-dairy milks will curdle it and turn it into a usable vegan buttermilk for pancakes, baking, or whatever else you may want to use it for! I always add apple cider vinegar to my creamy dressings and/or sauces to add a slight kick to the overall flavor. If something is too creamy, add a teaspoon of ACV to cut the flavor. 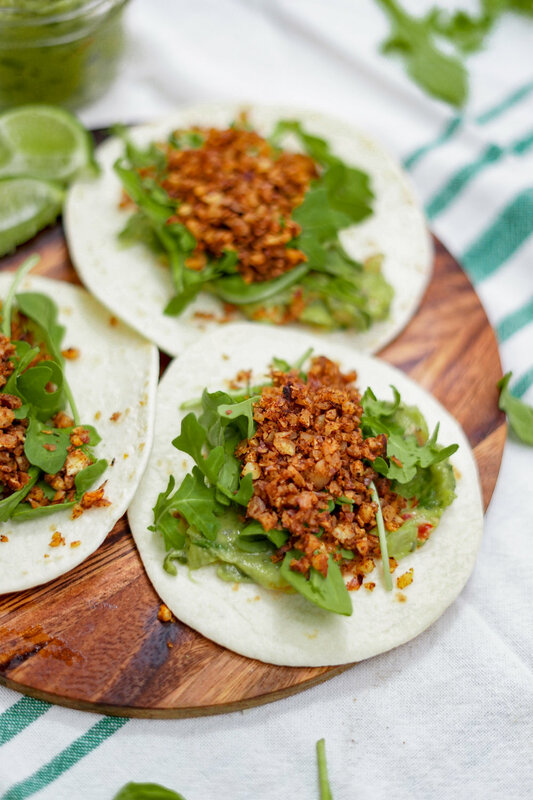 I also use it in my Hazelnut Chorizo Tacos to help break down the fibers of the hazelnuts and soften them, which gives them their meaty texture. Apple cider vinegar can be used in marinades, as well, so get creative! First, the brand you use is very important. 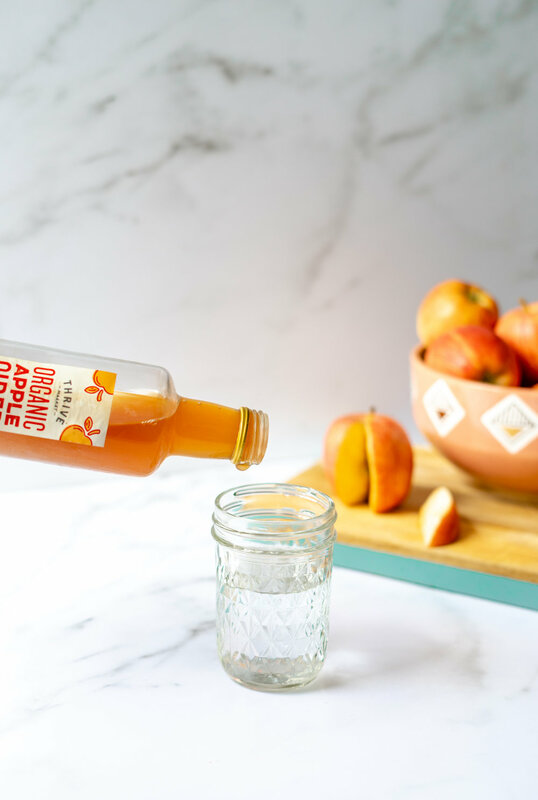 I use Thrive Market's apple cider vinegar currently (only because that's what I already have) but I would also recommend Bragg's Unfiltered Apple Cider Vinegar, which you can find at pretty much any grocery store. I recommend these two specifically because they clearly have the leftover fermentation in each bottle - that's the good stuff! Those floaters at the bottom are the fermented bacteria that will help your digestion and (supposedly) promote weight-loss. Add a tablespoon to 12-16 oz of water and drink up! I remember when I discovered apple cider vinegar could be used to clear up acne, I was shocked. I'd just gotten my first facial in my early teenage years and the esthetician told me to stop using the harsh, drying chemicals in drugstore toners and switch to ACV. The vinegar by itself can be a little strong for some people, so I recommend diluting 4 oz of ACV with 2 oz of water. Dab some of this natural toner onto a cotton pad and swipe all over your t-zone for healthier skin. Even the fanciest and most expensive of clarifying shampoos or hair masks won't always do the trick. This is when you turn to your pantry and get to the most basic and simplest materials to solve the problem. Because it's a vinegar, the natural acidity in it will help break down product build up while also balancing the pH levels on your scalp - science!